Who doesn't like small birds, and who isn't tempted to feed them? Many parks warn people not to feed the birds, but at Reifel Bird Sanctuary they sell suitable seed and encourage visitors to feed the birds. Both the visitors and the birds seem to love it. The black capped chickadees know a good thing when they see it and eagerly cue up to be fed. Unfortunately they move so quickly a few of my pictures are out of focus. The junco is a ground feeder too and quite a shy bird. The redwing blackbird cannot be described as shy. This fellow below has a spectacular set of epaulets. They are gorging at a feeder but I have seen them take food from an open palm. In the photo below the male is in the centre of the picture, the female is off to the right. I think this is a house sparrow, also quite well camouflaged. So you want to feed the birds this winter, what should you offer them? "Most birds that visit backyards in snowy weather thrive on seeds, since insects and fruit are harder to find naturally during the winter. The best foods to offer birds in colder weather have a high fat or oil content that will provide abundant energy for winter survival." Nutritious winter foods for birds include black oil sunflower seed, hulled peanuts, thistle (nyjer) seed, suet, peanut butter and white millet seed. Here are some photos I took of an odd little bird. It is a Coot, but is it a duck? "The waterborne American Coot is one good reminder that not everything that floats is a duck. A close look at a coot—that small head, those scrawny legs—reveals a different kind of bird entirely. Their dark bodies and white faces are common sights in nearly any open water across the continent, and they often mix with ducks. But they’re closer relatives of the gangly Sandhill Crane and the nearly invisible rails than of Mallards or teal." "Coots are dark-gray to black birds with a bright-white bill and forehead. The legs are yellow-green. At close range you may see a small patch of red on the forehead." "Although it swims like a duck, the American Coot does not have webbed feet like a duck. Instead, each one of the coot’s long toes has broad lobes of skin that help it kick through the water. The broad lobes fold back each time the bird lifts its foot, so it doesn’t impede walking on dry land, though it supports the bird’s weight on mucky ground." "American Coots in the winter can be found in rafts of mixed waterfowl and in groups numbering up to several thousand individuals." "The ecological impact of common animals, like this ubiquitous waterbird, can be impressive when you add it all up. One estimate from Back Bay, Virginia, suggested that the local coot population ate 216 tons (in dry weight) of vegetation per winter." A Coot "eats mainly aquatic plants including algae, duckweed, eelgrass, wild rice, sedges, hydrilla, wild celery, waterlilies, cattails, water milfoil; when on land they also pick at terrestrial plants and sometimes eat grains or leaves of oak, elm, and cypress trees. They’re not exclusively vegetarian. You may also see them eating insects (beetles, dragonflies, and others), crustaceans, snails, and small vertebrates such as tadpoles and salamanders." "Nests are almost always built over water on floating platforms and almost always associated with dense stands of living or dead vegetation such as reeds, cattails, bulrushes, sedges, and grasses. Occasionally, the nest may be built on the edge of a stand of vegetation, where it is clearly visible." "A slow and meticulous forager, the American Coot plucks at plants while walking, swimming, dabbling with its head just underwater, or in full dives. In flight coots are clumsy and labored (though less so than Common Moorhens). To get airborne, coots typically have to beat their wings while running across the water for many yards. Coots sometimes gather in winter flocks of several thousand, sometimes mixing with other waterfowl. They sometimes steal food from others including ducks. Coots sometimes lay their eggs in the nests of other coots as well as Franklin’s Gulls, Cinnamon Teal, and Redheads." I will end with a couple of YouTube videos. All about Coots today, I hope you have enjoyed your visit. Today I am sharing more birds from my Reifel Bird Sanctuary visit; this time the photos are of birds I haven't seen before. "Slim and long-necked, the Northern Pintail has a distinctive silhouette. The male is easy to identify by his striking markings and long tail, but even the female can be recognized by her graceful, long-necked shape." All these pictures are of the male Pintail ducks. "Chocolate-brown head. White neck and underparts, white extending up back of neck in thin line. Very long black central tail feathers. Black rear end bordered by yellowish tan patch. Sides and upper back gray. Lower back feathers long and black with pale edges. Rear of wing (speculum) bronzy greenish with black band and white rear edge. Bill black with bluish gray stripes. Eyes dark brown. Legs gray." The Northern Pintail is among the earliest nesting ducks in North America, beginning shortly after ice-out in many northern areas." "The oldest recorded Northern Pintail was a male and at least 22 years, 3 months old when he was found in Saskatchewan, Canada." "Nests in open country with shallow, seasonal wetlands and low vegetation. Winters in wide variety of shallow inland freshwater and intertidal habitats." Eats "grain, seeds, weeds, aquatic insects, crustaceans, and snails." "Northen Pintail populations declined throughout most of their range at a rate of 2.6% per year between 1966 and 2012, resulting in a cumulative decline of 72%, according to the North American Breeding Bird Survey. The 2014 State of the Birds listed them as a Common Bird in Steep Decline." First here is a Great Horned Owl high up in a tree. You can see one of its "feather ears" in the centre of the picture. 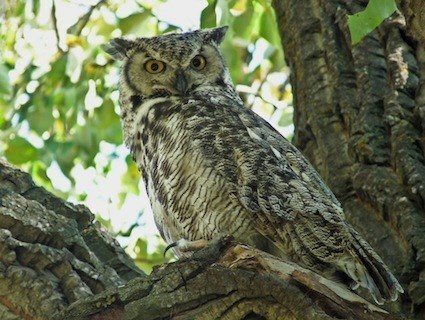 "With its long, earlike tufts, intimidating yellow-eyed stare, and deep hooting voice, the Great Horned Owl is the quintessential owl of storybooks. This powerful predator can take down birds and mammals even larger than itself, but it also dines on daintier fare such as tiny scorpions, mice, and frogs. It’s one of the most common owls in North America, equally at home in deserts, wetlands, forests, grasslands, backyards, cities, and almost any other semi-open habitat between the Arctic and the tropics." This my second owl, a back view of a sleeping owl, this one is a Saw-whet Owl. "A tiny owl with a catlike face, oversized head, and bright yellow eyes, the Northern Saw-whet Owl is practically bursting with attitude. Where mice and other small mammals are concerned this fierce, silent owl is anything but cute. One of the most common owls in forests across northern North America (and across the U.S. in winter), saw-whets are highly nocturnal and seldom seen. Their high-pitched too-too-too call is a common evening sound in evergreen mountain forests from January through May." Here is another shy bird, I only saw it because another birder pointed it out. "A secretive bird of freshwater marshes, the Virginia Rail most often remains hidden in dense vegetation. It possesses many adaptations for moving through its habitat, including a laterally compressed body, long toes, and flexible vertebrae." These last were in a distant field and I couldn't tell whether they were Swans or Snow geese. My guess would be swans because I think they are too big for Snow Geese. I only had one chance for a picture before they flew off. What do you think they are?